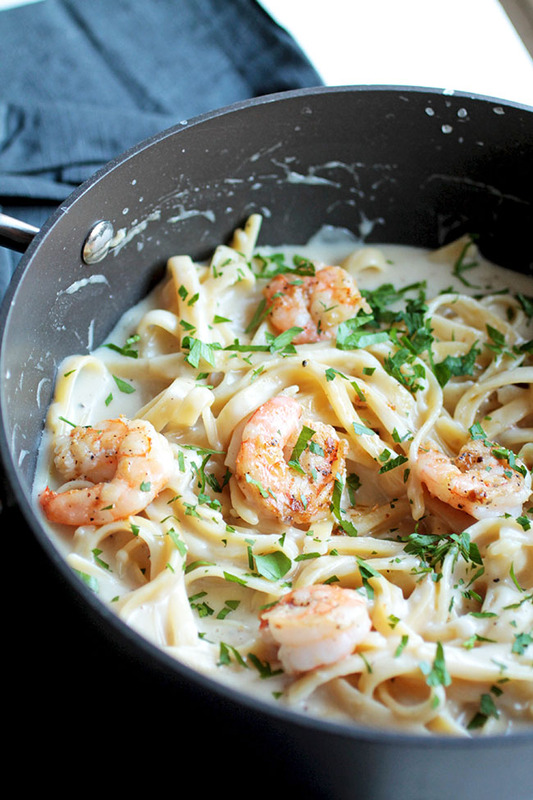 This easy shrimp alfredo pasta recipe is perfect for busy weeknights! A creamy white wine sauce, fettuccine noodles, parmesan cheese, and simple sautéed shrimp make a hearty and filling meal – and it’s lightened up with no heavy cream in sight! Today rocks! 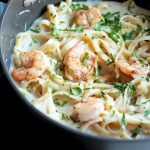 And it’s not just because I’m sharing this UMM HELLO AMAZING recipe for Creamy White Wine Shrimp Alfredo with you. 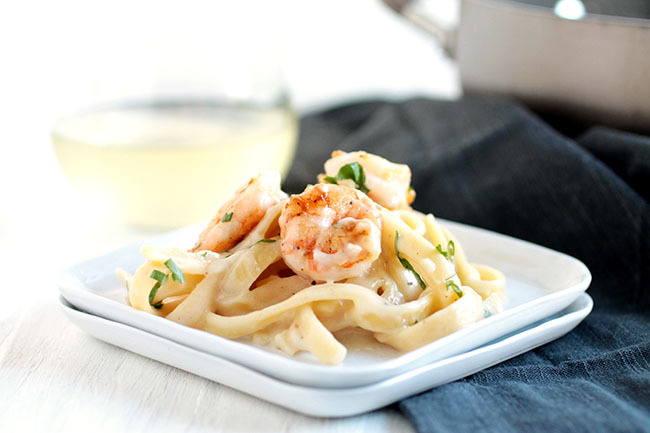 Today rocks because in addition to this concoction of garlicky shrimp tossed with fettuccine in a velvety white wine cheese sauce, we’re welcoming the fourth class of Blog Partners to The Sustainable Seafood Blog Project (SSBP)! 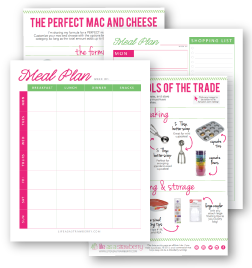 This is our BIGGEST PARTNER CLASS EVER – be sure to click through the links at the end of this post to say hello to them all, and to take a peek at the delicious seafood recipes they’re sharing! If you follow Life As A Strawberry, you’ve probably heard me talk a lot about The SSBP. I started it way back in 2013, pulling together a handful of bloggers who agreed we had a responsibility to use our online platform to promote responsible food choices. As food bloggers, we talk about food every day – and it’s important that we also talk about where that food comes from. Today, the SSBP is a certified nonprofit organization, hosting a brand new conference for food bloggers (which, um, you should all come to) this June in New Orleans, and has grown to include nearly 30 active food bloggers and a dozen business and nonprofit partners. I’m so proud of the work we’ve done, and I’m so excited to see what the future holds! I often get asked about a single “best” action someone can take to support sustainable seafood, but the truth is there are a lot of grey areas. There are differences between every fishery and we need to take those differences into account in order to make the best choices. Fortunately, we work with some amazing groups that are making that information a lot more accessible. I recommend downloading the Monterey Bay Seafood Watch App (FREE, Apple & Android) or the new Audubon Gulf United For Lasting Fisheries (GULF) app (FREE, Apple & Android). Both compile the latest research and third-party certification information to rate different species based on where and how they were harvested. Pull out the app at the fish counter to double check that you’re making a sustainable choice – it just takes a few seconds and can make a big difference. But let me tell you about this recipe! It’s easy, it’s total comfort food, and it’s made with Wild American Gulf Shrimp (huzzah!) It comes together in about half an hour, and also there is wine and cheese. It’s the perfect easy weeknight dish, but it’s elegant enough for a date night or dinner party. Dress it up with any veggies you have on hand – I love to add peas, asparagus, broccoli, or even tomatoes – or keep it simple for a classic, creamy shrimp Alfredo. Don’t forget to click the links below to explore the other amazing seafood recipes being posted today – and welcome this fabulous new class of Blog Partners to The Sustainable Seafood Blog Project! 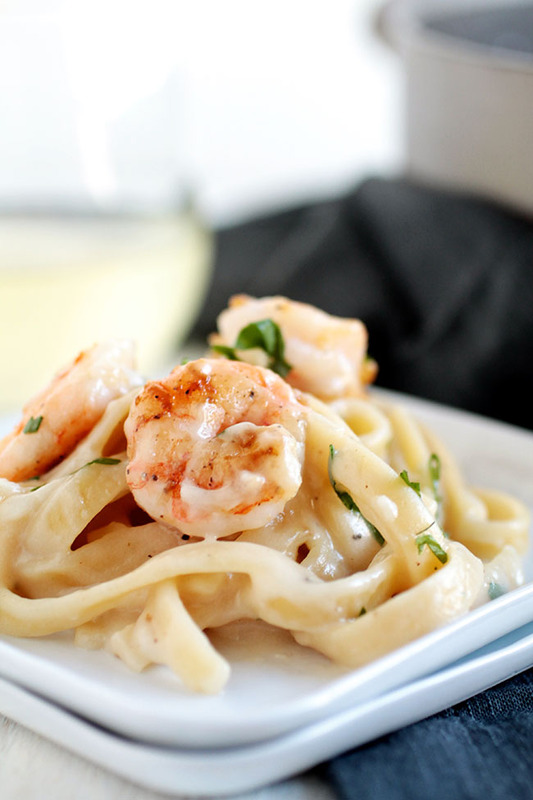 How to make White Wine Shrimp Alfredo – The Video! 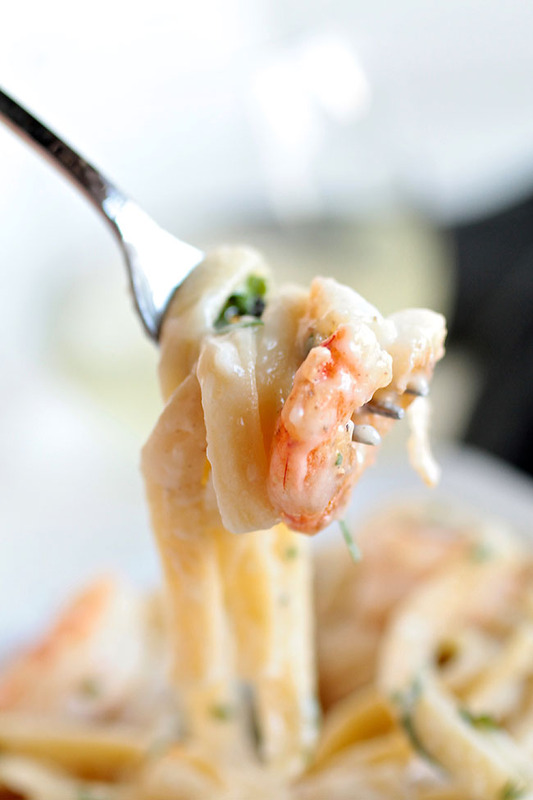 Creamy White Wine Shrimp Alfredo – simple and delicious! Cook fettuccine in very salty water until al dente. Drain, set aside, and return empty pot to the stove. Melt butter in pot over medium heat. When butter is melted, whisk in flour to form a roux. Cook for 1 minute. Slowly add white wine to roux, whisking constantly to incorporate. The mixture will thicken pretty quickly – just keep whisking! Add milk to mixture and whisk to combine. Bring mixture to a low simmer, whisking frequently, then remove from heat and stir in salt, pepper, and cheese. Stir until cheese has melted and you have a smooth sauce. Heat oil in a medium-sized skillet until shimmering. Add garlic, shrimp, salt and pepper and stir to combine. Cook, stirring occasionally, until shrimp is pink and cooked through. 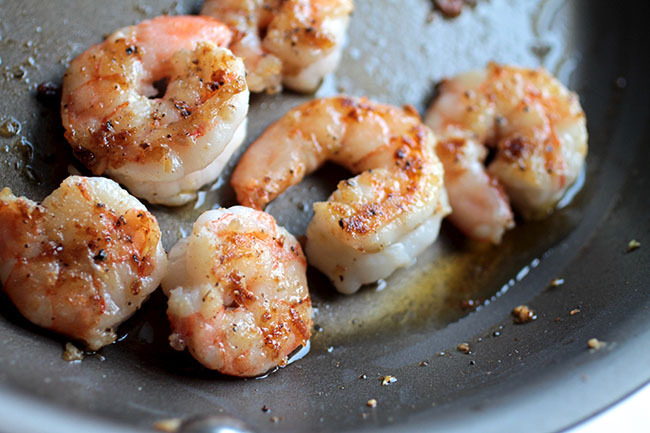 Shrimp quicks very quickly, so keep an eye on it – they shouldn’t take more than 5 or 6 minutes! Add cooked pasta and shrimp to sauce pot and toss to combine. Top with fresh chopped parsley for garnish and serve immediately. I always recommend shredding your own cheese for sauces. Pre-shredded cheese often comes coated in preservatives that 1) are yucky and 2) prevent the cheese from melting smoothly into a sauce. If you have the time, buy block cheese and shred it yourself for best results! If your sauce separates, zap it with an immersion blender to bring it back to a smooth, velvety sauce. If a sauce is too thick, thin it out by whisking in additional milk or other liquid. Hi Carmen, we love hearing it was a holiday hit! Great recipe, thanks for posting. Very popular with my wife and my 18 month old! Hey Gareth – Thank you! 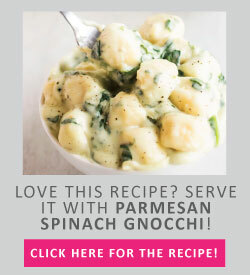 This recipe is legit! I was looking to recreate a wine/cream style pasta dish from a local upscale restaurant and yours awesome. It’s my go-to now.